Although the surface of a mattress can be cleaned with a vacuum cleaner, it is very difficult to completely remove stains from most standard mattresses. An unprotected mattress can become marked or stained quite quickly as natural perspiration produced throughout the night passes through a standard cloth sheet and creates a characteristic yellowish-brown tidemark where it has been absorbed into the upper surface of the mattress. Mattresses are also susceptible to many other contaminants. In addition to conventional natural fabrics, new forms of synthetic protector or topper have appeared over the years including memory foam and spacer fabrics. These are more expensive than conventional protectors but add the advantages of pressure relief and in the case of the later, the ability to be washed. 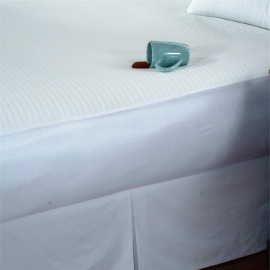 Waterproof mattress protectors keep the mattress clean by securing it from absorbing body excretions (such as sweat) or other liquids resulting from spills. These can take the form of flat rubberized flannel pads (commonly used under a bedsheet for infants) or special breathable fitted covers. 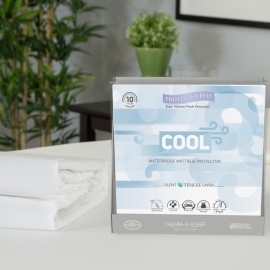 The plastic pads are hot to sleep on and change the feel of the mattress. A urethane laminate on cotton that has good wicking properties is an alternative to a rubberized flannel pad. 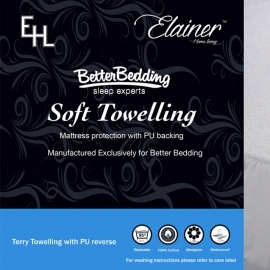 A protector with a thin laminate that is not pulled too tightly across the bed will not change the feel of the bed. Also, the laminate is still breathable which means that it will not trap body heat. 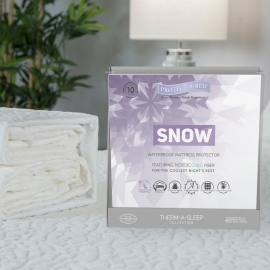 Mattress Protectors There are 6 products.